Thames sailing barges are a unique fleet of sailing ships developed in the 19th Century to carry cargo around the UK. Although based around the Rivers Thames and Medway they were real sailing ships and voyaged up and down the coasts and across the North Sea and English Channel. After the Second World War many of these barges continued to trade under sail alone until 1970 and some like Wyvenhoe were also converted into motor coasters. Out of about two thousand Thames sailing barges registered in 1900 there are now 28 full size former trading barges left in regular sailing commission. Her spritsail rig and distinctive traditional red sails make Wyvenhoe a fabulous vessel on which to sail. She is a staysail barge with five sails totalling 3,000 square feet of canvas. Wyvenhoe is still a working ship - but instead of cargo she carries people on holiday charters sailing in the Thames Estuary and the beautiful rivers of Essex, Kent and Suffolk or (by prior arrangement) from the Solent and some South coast ports. We provide day sails, weekend charters or longer trips aboard the barge for corporate guests and family sailors alike. You can hire the whole barge for static parties of up to 40 people or to take your friends and families sailing. We can carry groups of up to 12 passengers underway. Individual guests or couples or families can be accommodated on group sailing trips too. Wyvenhoe is an ideal base for artists and photographers. Tutored training in art, and photography, can be provided. Special trips are also available for bird watching and visiting areas of natural beauty or to see wildlife – like seals. Below deck the former cargo holds of the barge have been converted to sleeping accommodation for 12 passengers. Sailing barge Wyvenhoe is carpeted and heated with mains power available from her generator, electric toilets and showers, pressurised hot water system and a fully-equipped kitchen. There are leather sofas and dining tables in the barge's main cabin, with television and radio and equipment to listen to music. Safety equipment is carried aboard the barge as specified by the Maritime and Coastguard Agency. She has modern safety features, including her auxiliary engine and generator; GPS satellite navigation system, chart plotter, radar, VHF radio, AIS, Navtex, together with safety lines around the decks and life jackets for all passengers and a life raft. 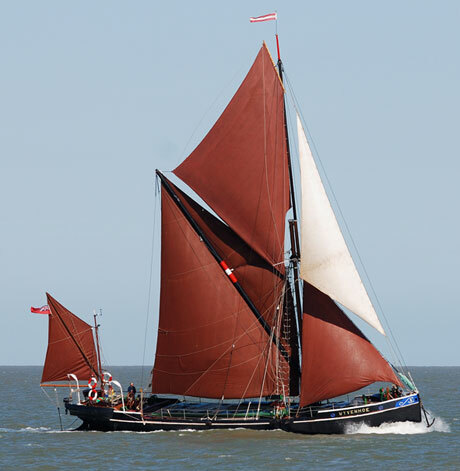 We provide a qualified sailing barge master and experienced mate, and sometimes a third hand and a cook too. But we always encourage all our guests to participate in sailing the ship if they wish. We can provide specific tuition and assist anyone who wants to learn seamanship skills or become a qualified sailing barge master or mate. Wyvenhoe is currently undergoing restoration and is not available for charter.